At Prime Landscaping we understand that a garden is an extension of your home and should be designed to reflect your taste and style. Creating the right "street appeal" is a vital factor in establishing and maintaining residential property values. As well as providing comprehensive front yard landscaping packages to residential estate developers, we also offer a full range of landscaping services to homeowners and property investors. Properly planned and installed, your garden will be a paradise where you can relax and entertain. An outdoor room will provide a private sanctuary, a haven where you will escape the stresses of everyday life. 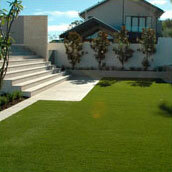 A unique custom residential landscape design will enhance street appeal and increase your property's value. Whether you require a complete garden renovation or a simple makeover, we will ensure that your individual requirements and functionality are central to the design, taking into account your needs, soil aspect, garden theme, plant selections, maintenance level and budget, ensuring that the end result value-adds to both your lifestyle and your property. We provide a comprehensive landscaping design service, from a small backyard to a full commercial upgrade. And, we make sure that you know exactly what you receive for your investment so that your only surprise is the fantastic end result. Prime Landscaping provides boutique landscaping, a very distinctive and personal expression of a homeowner's unique taste, interests and lifestyle. Managed by our experienced team, we work closely with homeowners to design and install innovative and effective garden designs. 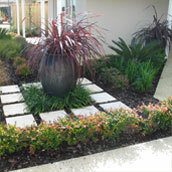 Landscaping plays a vital role in creating safe and friendly environments in new housing developments. With this in mind, many Residential Estate developers offer landscaping incentive packages. Prime Landscaping has been selected by number of these developers to provide new home owners with individualised front yard landscaping. We will work with you to design and construct a garden that not only compliments your new home but also maintains the high standard of landscaping within your estate and meets the guidelines set out by your land developer. Prime Landscaping currently provides front yard-landscaping packages for Bletchley Park and the CY O'Connor and Quattro Estate. Of course, if your new home doesn't come with an incentive package, we will gladly work with you to help you ensure that your new home stands out from the crowd.